When is a platformer not a platformer? When it’s a shoot-’em-up, of course. That’s the dual nature Gelly Break presents you with. A puzzle-platformer that requires you to flip between two different colours while jumping and shooting copious numbers of enemies all at once. To say it’s challenging would be an understatement, but add in the option to play co-operatively, and things start to get really interesting. As a solo experience, Gelly Break takes that familiar Ikaruga-style mechanic that uses two separate colours to define which platforms you can land on and which jump pads you can use. Things start off easy enough, with large coloured slabs laid out in alternating fashion. Later on, things start to get a little tastier as those platforms fall away or move at varying degrees of speed. It’s a game that’s always keeping you on your toes, one way or another. You can switch by hitting ‘L’, ‘Y’ or ‘X’, while jumping is tied to ‘R’, ‘B’ and ‘A’. 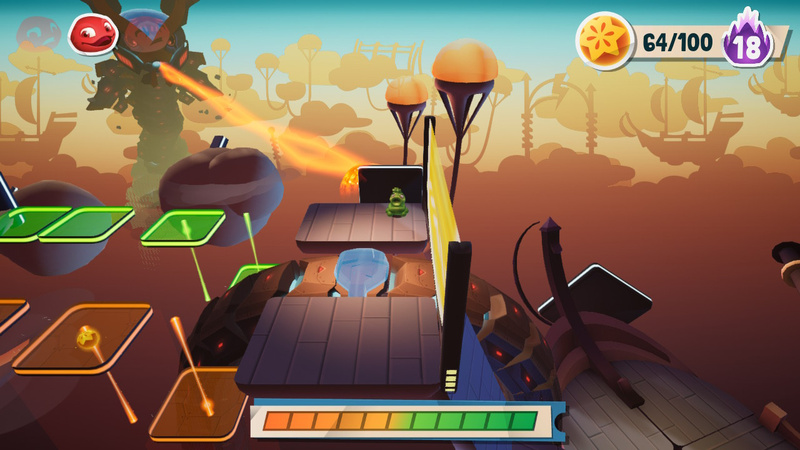 Having multiple button positions present at once might seem like an odd choice, but it makes sense when you consider this is a co-op friendly title and some additional hazards will require you to juggle shooting, jumping and moving at the same time – bridges that only appear as you move across them being one such precarious method of traversal. Enemies come in various shapes and forms from simple spiked red fellows that only need a few shots from your coloured snout (you use the right analog stick to fire, twin-stick shooter-style) to glowing pink orbs that shoot you while flitting about in set patterns. There’s a cute twist where these enemies also have altered variants, such as black and white versions that, when hit, turn to glass and can only be destroyed by changing colour next to them and smashing them to bits. When added to the need to leap between moving platforms that fall, rise and disintegrate on contact (and that’s even if you’re the right colour) and you soon realise there’s plenty to keep you occupied. 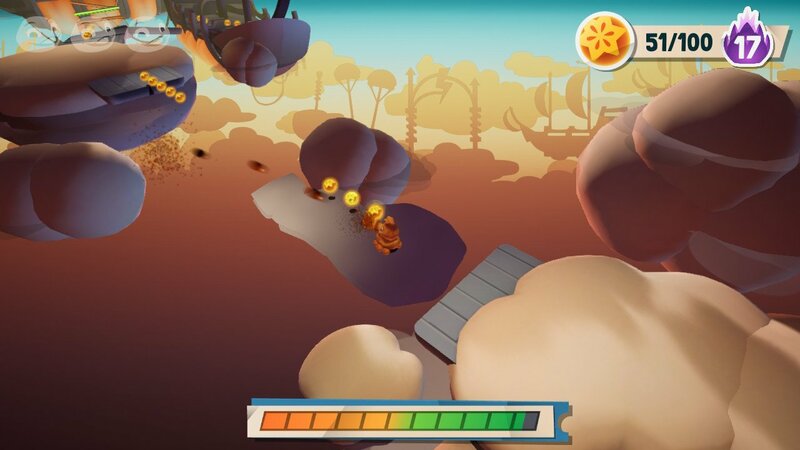 Rather than selecting a difficulty, you can progress to a tougher level by collecting three blob-like creatures sealed in glass containers. Reach the end of the level with all three and you’ll get to try a level (and a boss) that’s going to test your skills to the limit. For instance, one harder level requires you to juggle all the above and progress through areas where every few seconds a bolt of lightning will strike you. There are pylons dotted throughout to protect you, but reaching them in time adds in another factor to consider while tackling all of the above. You can complete the entire game solo, including every boss that appears at the end of each respective level, but you can also see how you stack up (quite literally) in Gelly Break with local co-op. While playing solo simply requires you to swap the colours of your blobby duo to solve puzzles and reach new areas, co-operative play is a far more challenging (and ultimately far more rewarding) experience. 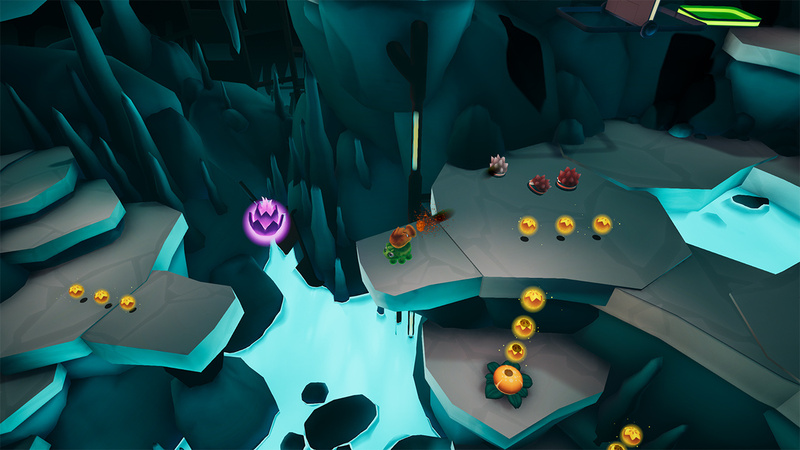 Now, each player permanently controls one of the two alien jellies and will need to leap atop one another in order to solve puzzles together. 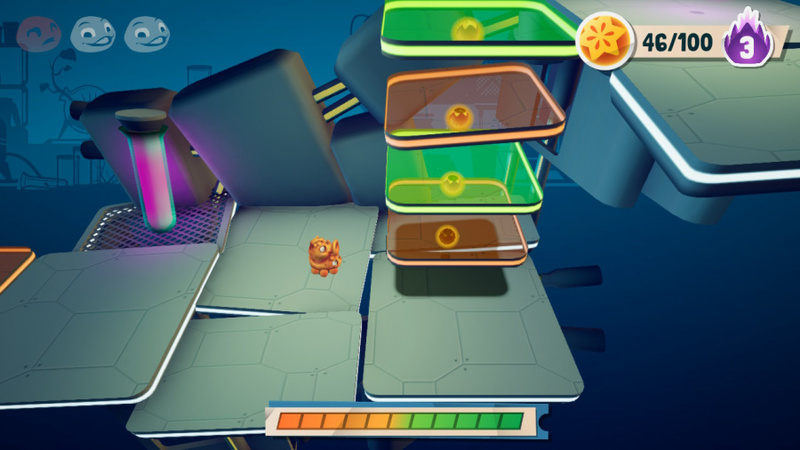 So in order to cross a gap with an orange platform in the middle, you’ll need to make sure the orange blob is swapped to the bottom, for example. Oh, and you can only swap when both of you press your respective buttons, so teamwork is the be-all and end-all in this mode. So when you need to leap to multiple platforms with alternating colours, both of you will need to hit swap at the same time in order to ensure the right colour hits the platform – or it’s a quick drop to your doom. Thankfully, that doom only comes at a small reduction in health, and floating pieces of life-replenishing food are relatively common, even on the harder difficulty levels. 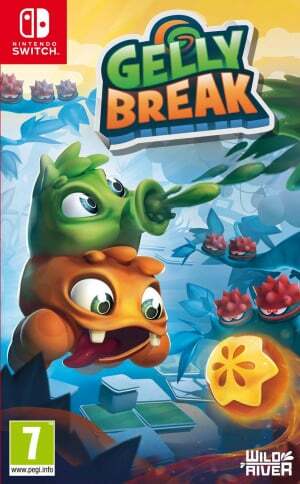 Overall, Gelly Break is an enjoyable couch-play affair, but it comes with a few niggling problems. The camera can be very unpredictable at times, often getting stuck behind assets in the foreground – which is a real problem considering the game regularly throws swarms of enemies at you while you circle and shoot in every direction. The odd camera angle can also make judging jumping distances something of a guessing game, although you’ll eventually learn to gauge the right amount of jump needed to leap a gap with Gelly Break’s slippery physics. The game also doesn’t support the use of a Pro Controller. We get why – this is a drop-in/drop-out co-op game all about splitting the Joy-Con – but for those who prefer their Pro to any other controller setup on Switch, it’s a frustrating omission. Gelly Break isn’t a perfect platformer/isometric shooter hybrid, but it showcases such creative aplomb it manages to make itself stand out among a vast number of couch-play titles already available on Nintendo Switch. While enjoyable in single-player, this really is a game best experienced locally with a friend – where something as simple as traversing a platform becomes an exercise in mutual harmony or a tragedy of teamwork. I was on the fence until I tried the demo. This game is awful in single player, though I would give it a try if you have a friend over. In my opinion, it’s not worth the large price tag when other games will give you more bang for your buck. @GyroZeppeli Yeah I can see this being appealing to someone who is always playing with others, but if you are usually playing single player it is good to know that this is a pass. Seems interesting and could make for a good lets play. However, that price is a bit tooo high. I’ll pass on the price. But I might have caved if they would have spent that extra money they were asking for to get the Q Bert License before borrowing the design. @AstralOrange - He's the video game equivalent to a child star. Always appearing in some off brand commercials and cameos, but never returning to glory. Try the entire game next time. @panthro It’s just an opinion man. I’m not going to try the whole thing if I hate the first few levels. @AstralOrange - Plot Twist: He's P. Plant's echo.